At Bloggers Anonymous—we normally frown upon spreading propaganda that minimizes the serious nature of our cause. However, in the name of education and awareness, we would like to point to the this juvenile “Top 10” list of “symptoms” which indicate you may be a addicted to blogging. We will not reveal the authors as to not credit them in any way. Please be aware that this ignorance is out there—and defeating the spirit of our cause. 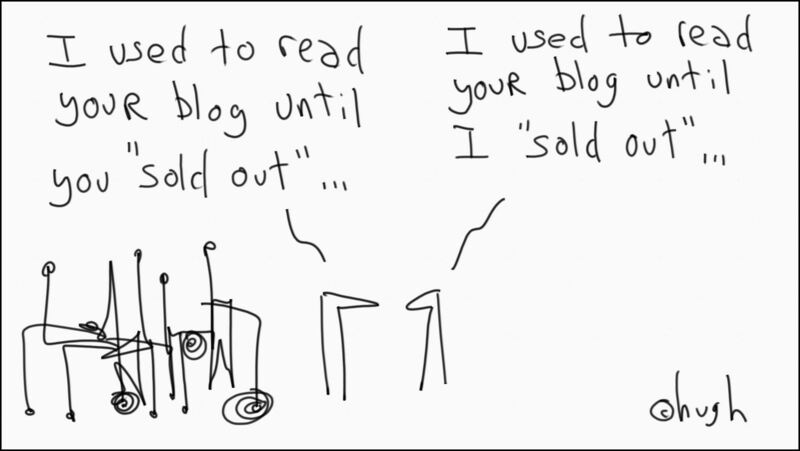 This illustration from Gaping Void shows just how cut-throat and pretentious the blogging world is. It's a world filled with egos, (blegos), self-righteousness and celebrity-like naval gazing. It's no wonder why bloggers are so easily addicted. Please stop the madness. Seek help today. We at BlogAnon embrace different points of view—no matter how small minded and un-informed. We pride ourselves in keeping our Blog Ego (BLEGO) in check. In the spirit of polite discourse—we embrace this extremist viewpoint from Ann Handley. "Listen up, friends. Blogging is not a disease; it’s a lifestyle. What’s more, it’s one that you’ve truly chosen and embraced. Societal pressure is intense, isn’t it? People always trying to make you what you’re not, trying to make you feel like there’s nothing wrong with them, suggesting it’s YOU who has a problem? It’s bunk, friends. Don’t buy it. Frankly, family is overrated." It's difficult to watch this—but necessary in order to understand the disease. Selina is one of the million individuals who need our help. She doesn’t even know it. Please take her cry for help seriously—what’s needed here is intervention, not apathy. For further information—please contact Gabby Hon, VP BRB, North America. It’s come to our attention that Marketing Profs, has taken the unfortunate position of mocking Blog Addiction. Blog Addiction is a very serious and very real condition wreaking havoc in families across the globe. We at Bloggers Anonymous do not condone this type of behavior and are sad to see that there are professional organizations out there making light of Blog Addiction, Compulsive Blogger Syndrome (CBS) And Accute Blog Compulsion (ABC). Bloggers Anonymous would like to take this opportunity to encourage those suffering from this unfortunate affliction—to boycott Marketing Profs and related sites. We regret taking this O’Reillyan action—but see no other alternatives. We will be happy to lift this boycott if Marketing Profs publishes a complete apology on their blog. Please Join us in our cause. The staff at Bloggers Anonymous.